It's looks good and I can't wait. Although I'm not a huge fan of this 'flat' trend on the desktop, I really hope it's just a passing fad (please OS X 10.10 don't go flat). Contrast, depth, highlights and shadows help provide context where it's needed and aide in guiding a user through your app. I was happy to see the updated iWork applications for Mac not follow this trend. They're clean, simple and borrow some elements from the flat aesthetic (segmented controls for example) but still feel like a Mac app. It's funny that you mention that because at first glance it looked like a Windows 8 app to me. More importantly – Mailbox for Android is actually here! Seriously, does everyone on DN use iOS? Not me! I'm super excited it's out on Android. This was news to me too. I'm pumped! Really looking forward to this. The thumbnail looks great, but I'm really excited to have "Later" support on the desktop. Making do with Airmail for now. PS. Does anyone else wonder if Drop/Mail-box is prepping their own hosted email solution? They already can handle dropbox-ed attachments. Might be quite a contender for Gmail. About your PS, I wish that was happening! 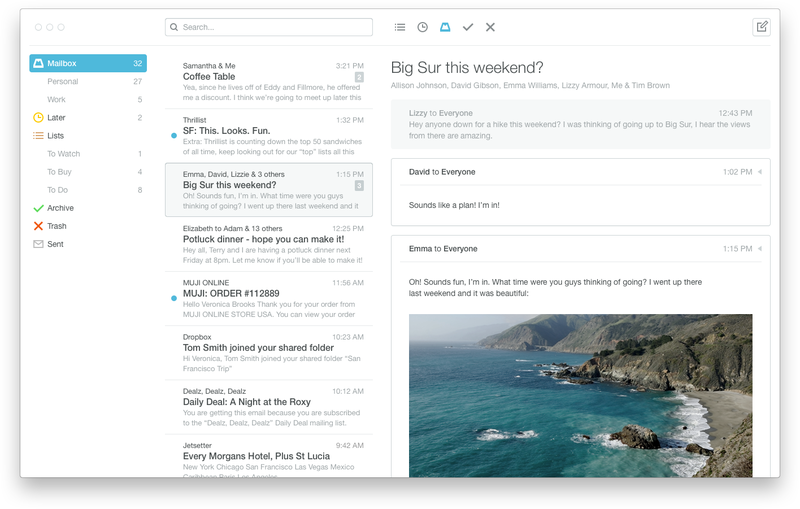 I think of mailbox as a really good layer on top of email and I think it would be a lot of work for dropbox to build out their own email service. But not saying I wouldn't use it! Yeah, sorry about that. I was too excited. No problem, no problem :) But thanks to you I'm in "waiting mode now" - so Thanks! How do I partake in the goodness that is this piece of software? First thing I thought of was Github for Windows. Is it better than Airmail? I'm always looking for better and more streamlined email experiences, but Airmail has been super awesome for me. I can finally stop using my phone to schedule emails while I'm on the computer. Seriously. I do the same. "If you're interested in being part of the potential beta group THIS FALL..."
It looks wonderfully nice. Let's see how it works like. Inky Mail also looks wonderful, but it's way slower on my Macs. Does anyone have hi-res screenshots. The thumbnail they have on the blog looks good, but I want bigger! Ooh la la, oui monsieur! My prayers have been answered! I'm a big fan of the mailbox workflow, but most my emailing happens at an actual computer. This is what I was wanting. Anyone looking for a great mail client for Mac should check out Airmail. This is the next step to Mailbox starting their own email domain, right? Does anyone have the link to this keynote? I'm seeing pictures of a keynote everywhere but can't find the link to it. I don't think it's available yet. According to the Mailbox blog post, the keynote will be posted to the Dropbox blog later today.